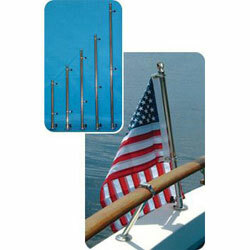 This deluxe flag pole set features highly polished 304 stainless steel from top to bottom. Other flags, such as club burgees, private signals and courtesy flags for use on sailboats, should be approximately 1/2 inch for each foot of the highest mast above the water. The shape and proportions of pennants and burgees will be prescribed by the organization which they relate to.